Find this article and more in the February edition of North Carolina Lawyer magazine online. According to statistics in the ABA Legal Technology Survey Report 2018, respondents on average report that 69 percent of their fees are based on hourly billing, and the larger the firm the more likely they are to rely on hourly pricing. Similarly, in Clio’s Legal Trends Report 2017, historical data pulled anonymously from Clio users showed that 84 percent of users are tracking and billing clients by the hour versus 16 percent who are billing using flat fees. The Chicago Bar Foundation’s Pricing Toolkit asserts that even without using the billable hour as a fee basis, you will still want to understand how much time you are spending on your legal matters for a variety of reasons. First, time is a key ingredient in determining your costs and efficiency. Second, you may need to document the time you have spent on a matter for a fee petition or to respond to inquiries about the work you have done for a client. Even if you aren’t billing for time, tracking it allows you to look at your time in the context of how you can most efficiently use technology, collaboration, and other means to deliver the highest value to your client at a price that allows you to be successful. The concept of multitasking makes tracking time very difficult. Numerous studies over the years have suggested that people cannot do two things at once. Louisiana State University psychology Professor Emily Elliott stresses the fact that multitasking of any kind reduces the productivity and/or increases rate of errors, thus generating unnecessary frustrations. It has been estimated that $650 billion a year is wasted by U.S. businesses due to multitasking. While some studies have shown that some people are better at multitasking than others, the so-called “super taskers,” even they cannot do two things effectively at the same time. And, even if you could, you shouldn’t bill two clients for the same time period. Created by entrepreneur Francesco Cirillo, the Pomodoro Technique is a time management philosophy. The effectiveness of the concept is based on allowing you to work with focus to accomplish a task while allowing time to maintain mental alertness. For each project to be tackled, a disciple of the technique works in 25-minute increments, with a five-minute break in between. 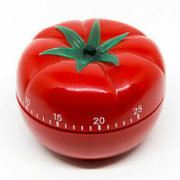 The 25-minute work period is called a “pomodoro” because Francisco Cirillo used a round kitchen timer shaped like a tomato. After four pomodoros have passed, the person takes a 15-20 minute break. To get started, choose a task to be accomplished, like writing a memo, performing legal research, checking and responding to email or reviewing a document. Set a timer for 25 minutes. Work for 25 minutes then take a break. In the classic technique, the user would write down the task and add a check for each 25-minute increment. After four checks take a longer break. For a lawyer who bills in six-minute increments, a 24-minute pomodoro will make it easier to track time. Many practice management applications include timers so you can easily bill the client for the time elapsed, stop the timer, take a break, and resume the clock for another 24 minutes. The pomodoro is an “indivisible” unit of work, meaning that if you are met with a distraction you will either end the pomodoro, save your work and start a new one later or postpone the distraction until the pomodoro is complete. Cirillo suggests the “inform, negotiate, and call back” strategy to deal with distractions. Inform the party who is distracting you that you are working on something and negotiate when you will get back to them. Then contact the party when your pomodoro is complete. One interesting aspect of the Pomodoro Technique is that it lets you recreate how you go about work. For instance, instead of tackling your inbox in chronological order, consider sorting by “from” and read through an email thread and then respond after any research or preparation is performed. Then migrate all the emails in the thread into the client folder. If you choose not to pause your inbox entirely, another option is to turn off the visual and auditory notifications for every new email. In Microsoft Outlook go to File – Options – Mail and under Message arrival uncheck ALL the boxes in the settings. All the bings and pings create a Pavlovian response, getting you to look and react instead of concentrating on the task at hand. Another distraction is your phone. Like email you can check voicemails on a schedule. Set your phone to go directly to voicemail and have your voicemails sent to your inbox. Then you can tackle both voicemail and email at the same time! If the voicemail is not urgent respond with a meeting request so you maintain control of your time. Lawyers are under many pressures throughout the day to zealously represent clients, network and market, and get the bills out. There are a thousand pressures and a million distractions. Time management techniques are met with enthusiasm and skepticism. There are many tactics to try, not any one will be the right fit, but take one and make it your own and see if it can help improve your workflow, help track time, and increase your productivity without adding to your stress.